I didn't bother posting a Saturday Sky last week, because it was just more of the same -- blue sky, a few fluffy white clouds. Very pretty, but all it means is 100 degrees and no rain. Earlier this week, they were predicting lower temperatures, maybe the high 80s, over the weekend, but now, once again, it's supposed to be 100. 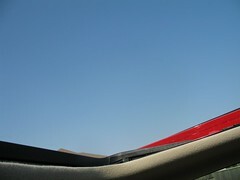 Anyway -- here's the hot South Texas sky, taken from my car's sunroof around 10:00 this morning.